The lives of Batman, his allies, his enemies, and even the city of Gotham itself, have become the focus of this landmark DC Comics weekly series as the Dark Knight’s world has been explored like never before over the course of this year-long event. 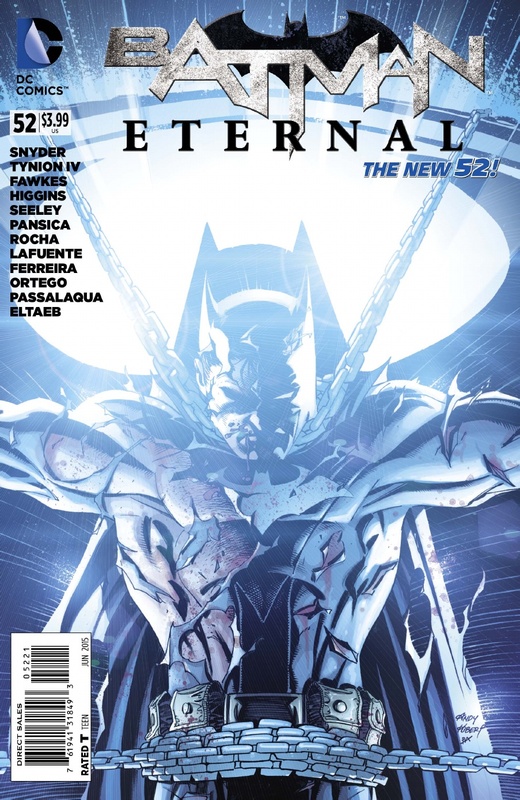 The Bat-Epic concludes here in Batman Eternal #52, with a story from writers Scott Snyder and James Tynion IV, script also by Tynion, along with consulting writers Ray Fawkes, Kyle Higgins and Tim Seeley, in this special extra sized issue as Batman Eternal reaches its thrilling climax. 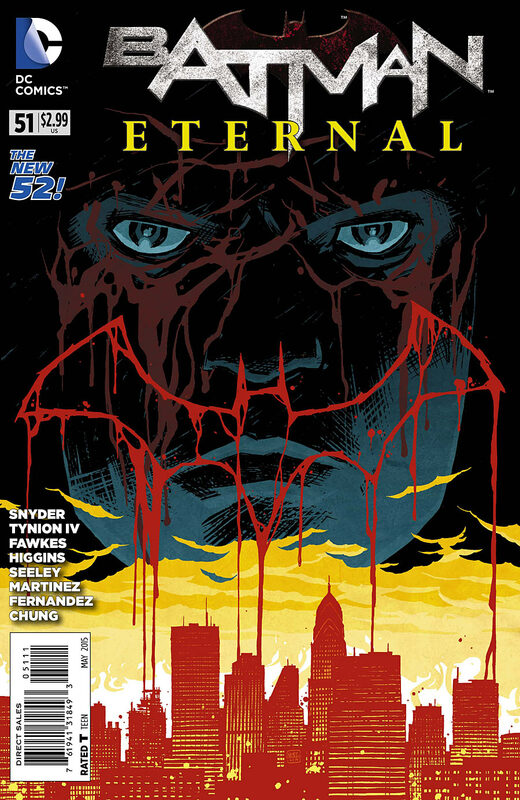 Batman Eternal #52 gives us only moments to recover from last issue shocking cliff-hanger, with an ominous flashback to The Night of the Owls and a fortuitous meeting at Harbor House, before the action-packed showdown between Batman and Lincoln March takes centre stage. While it may have been Cluemaster’s plan, it was actually Lincoln March that funded the entire operation with the resources he plundered from The Court of Owls. Now as the confrontation between March and Batman atop Beacon Tower takes to the air, this violent reunion between these supposed Wayne brothers soon comes crashing down to earth, and the location for their final battle proves a fittingly apt battleground for “Eternal” to play out on. The pace of this issue doesn’t let up for a moment. As the fate of Gotham City hangs in the balance, it’s up to Batman’s allies to do whatever they can to help the civilians escape from the carnage that has griped the city. With Penny One and Penny Two coordinating their efforts, Batwing, Red Robin, Bluebird, and Red Hood all have their work cut out for them, and even Batgirl must race to make a last minute rescue when she least expects it. Batman Eternal #52 features a wealth of stunning artwork for this final issue provided by: Eduardo Pansica & Julio Ferreira, Robson Rocha & Guillermo Ortego, David Lafuente, Tim Seeley, and Ray Fakes (Artists), along with Allen Passalaoua, Gabe Eltaeb, John Kalisz, John Rauch (Colors), Steve Wands (Letters), with a stunning cover by Jae Lee & June Chung, and variant cover by Andy Kubert & Brad Anderson. 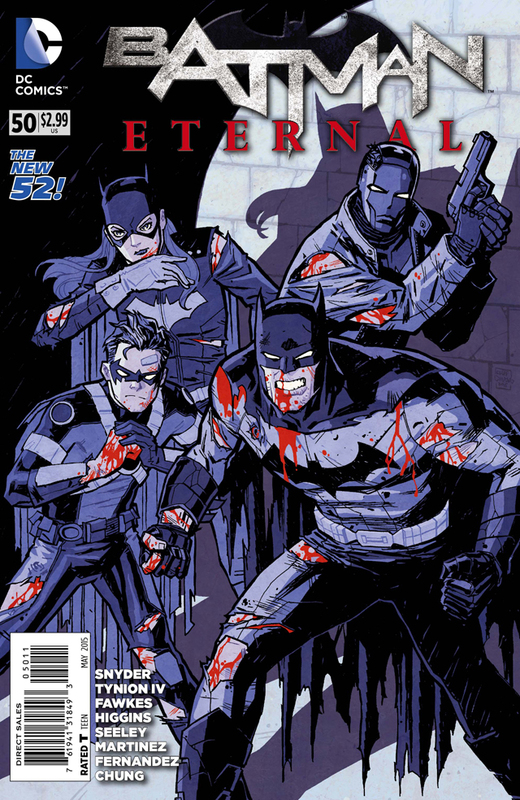 The different artistic styles form a perfect cohesion between the striking visual and intricate plotting required for this final issue of Batman Eternal, as the year-long storyline draws to a close. The collective work produced here is staggering, every scene builds towards the glorious moment where Jim Gordon address the city, whereby a clever twist inspired from events in Zero Year is utilized to create an urban victory for Gotham City as dozens of Bat-Signals light up the sky. It’s a rousing scene, and one of Batman Eternals finest moments ever! 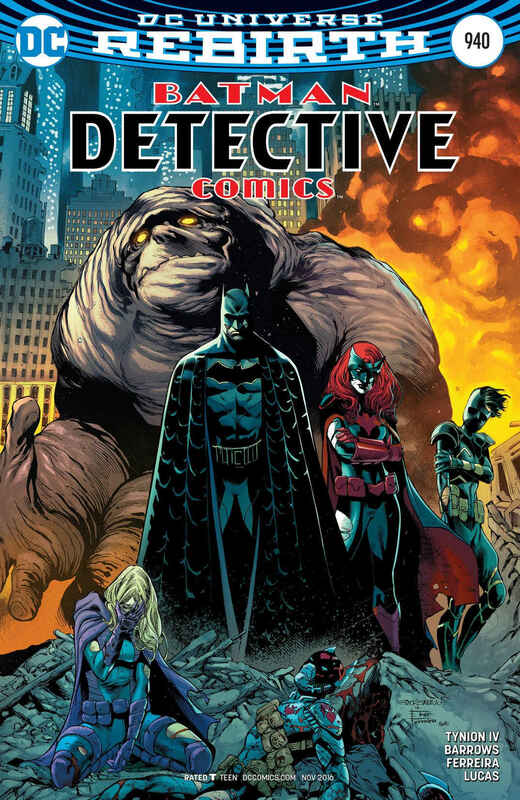 With new allies joining the fray to help the Bat-Family, Commissioner Bard and the GCPD also receive some unexpected help, Spoiler faces her most life changing decision of all, and Batman’s fight with Lincoln March reaches a crucial juncture. 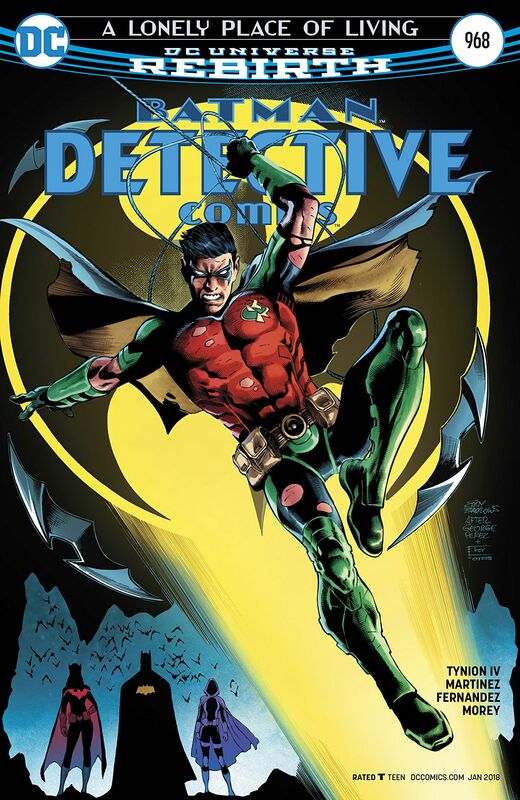 Ever since Lincoln March’s fate and supposedly true identity as Thomas Wayne Jr was left unresolved in Batman #11, the characters return has been long expected, and the flashback to his encounter with Cluemaster brings further insight into the role he played in orchestrating the events in Batman Eternal. The fight between Batman and Lincoln is a savage, brutal, no-holds-barred struggle, but even though Batman’s rag-tad suit is hardly a match for Lincoln’s armour, Bruce fights on, even when it seems everything is lost. It proves how indomitable the legacy of the Dark Knight really is, despite everything Bruce has had taken away from him: be it the gadgets, the money, whether being driven to the brink of physical and mental exhaustion, or even having the cape and cowl ripped away, Bruce Wayne is still the Batman, with or without all the trappings, and his personal resolve, strength, faith in his allies, and his dedication to city he is sworn to protect remains as unbreakable as the night that fateful gunshot rang out in crime alley. So much has happened over the last year: Commissioner Gordon was framed and sentenced to life in Blackgate for unwittingly causing the subway train accident that killed over one hundred Gotham citizens, Selina Kyle went from cat burglar to Gotham’s new Kingpin of crime, Wayne Manor was transformed into a new Arkham Asylum after the latter was destroyed following an explosive supernatural event, a nano-virus wreaked havoc in the Narrows of Gotham, and the Dark Knight and his allies were tested to the limit as they battled the villains of Batman’s rogues gallery in their quest to discover the mastermind behind it all. 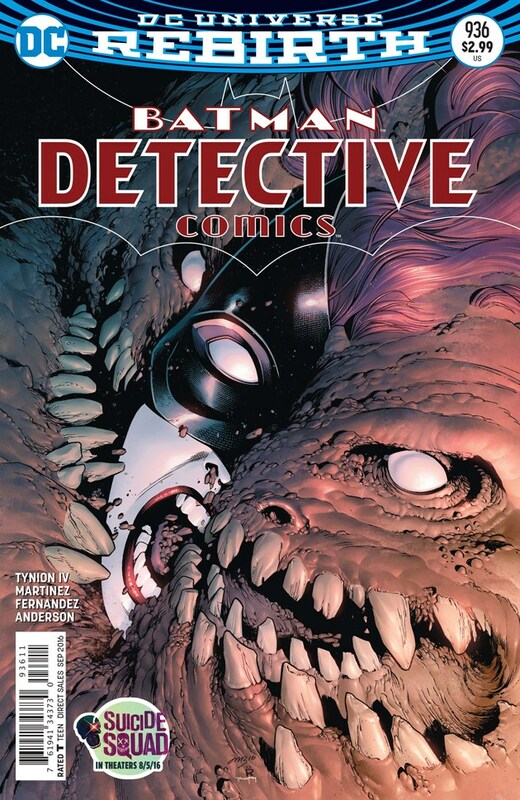 Sure, there were a few issues where the focus of the plot meandered a little, some characters story arcs were better developed than others, but overall I think Batman Eternal provided a really gripping and exciting storyline, one that has – for the most part at least – delivered the goods week after week. The resolution to the fight between Batman and Lincoln March is another of Batman Eternals standout moments. While perhaps not exactly the battle royal we might’ve been hoping for, that magnificent two-page spread during the major turning point of the fight is an absolute killer moment, and the scene which follows afterwards between Jim Gordon and Batman sums everything up perfectly. 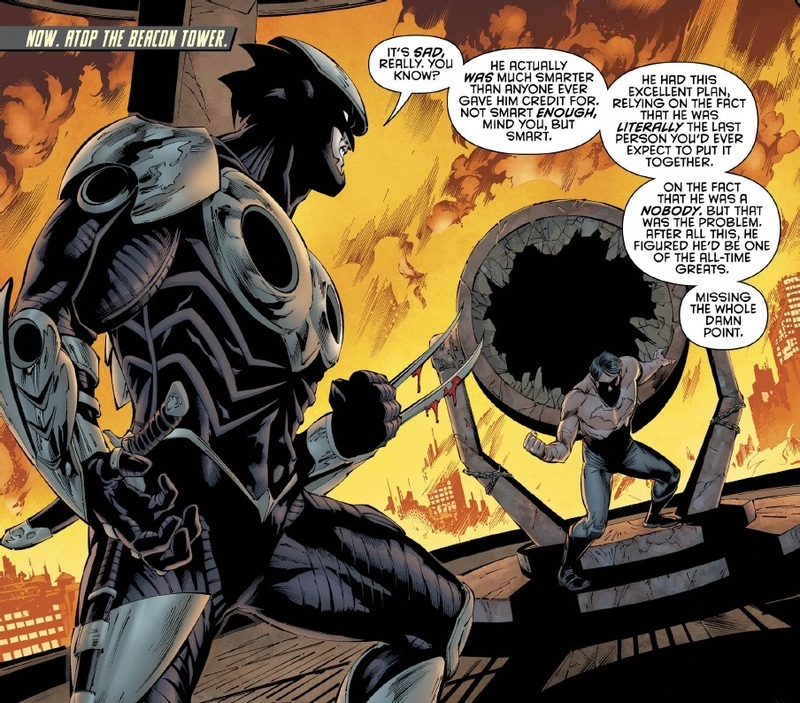 From here Batman Eternal gradually winds down though a series of codas that neatly ties up some loose ends and sets up some potential storylines for the future. The times they are a changing in Gotham: especially for Jason Bard and Vicky Vale, Batman and Catwoman, Penguin, Batwing, Barbara, Jason Todd, and Harper and her new flatmate, but my favourite closing scene was a particularly fun moment between Stephanie Brown and Red Robin. With everything in Batman Eternal taking place before the current events unfolding in Batman Endgame, the fallout from this year-long series is sure to influence the shape of things to come. 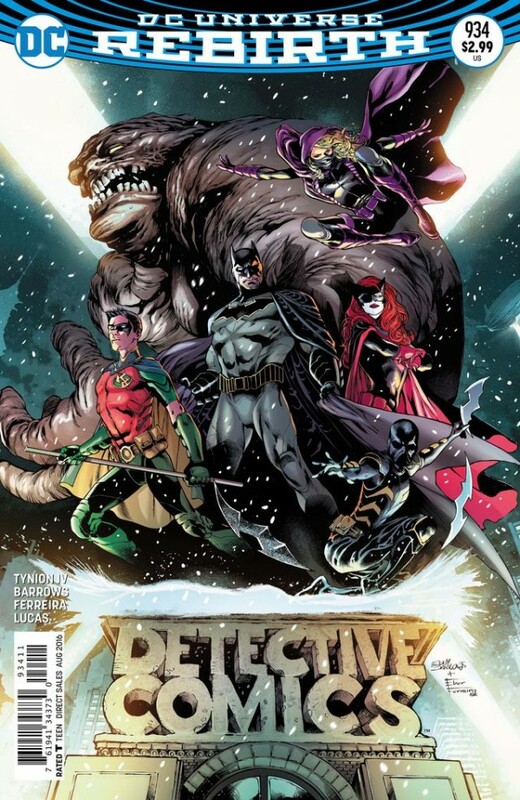 We still have Batman #40 and the face-off between the Batman and the Joker on the cards for the finale of Endgame, then we’ve got the intriguing prospect of an “All New Batman” debuting in Batman #41, and if all that wasn’t enough for us to look forward to Batman Eternal Season 2 is also on the way. 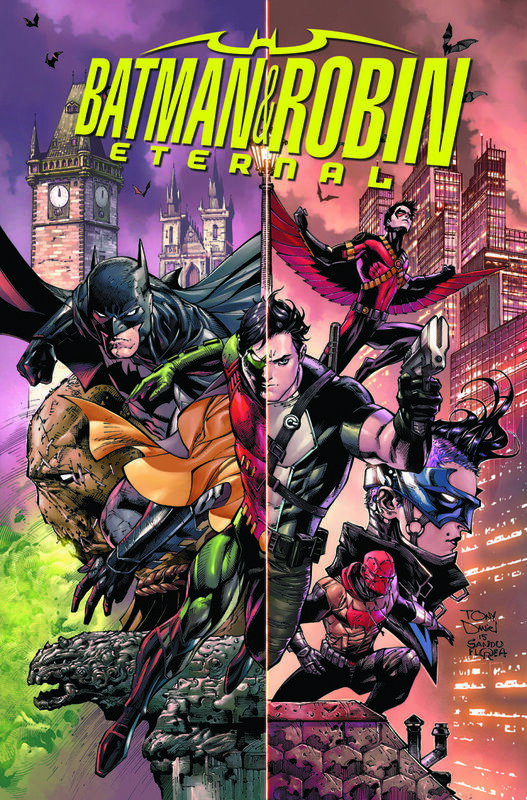 This second Batman Eternal storyline will be focused more on Robin and the characters that have been involved in the Dark Knights legacy as Robins, and it will be a major story event that will celebrate Robin’s 75th Anniversary! The last page of Batman Eternal is magnificent point to close on. Over the last year we’ve seen how the Dark Knights world has gradually been torn down around him. Now, as Batman and Jim Gordon look out across the Gotham skyline it becomes apparent just how far reaching the events of Batman Eternal have been for everyone involved. Its been a tough year for Batman and Gordon, nevertheless they stand ready, prepared to face whatever the future might hold, and carry on the good fight for Gotham one more time. 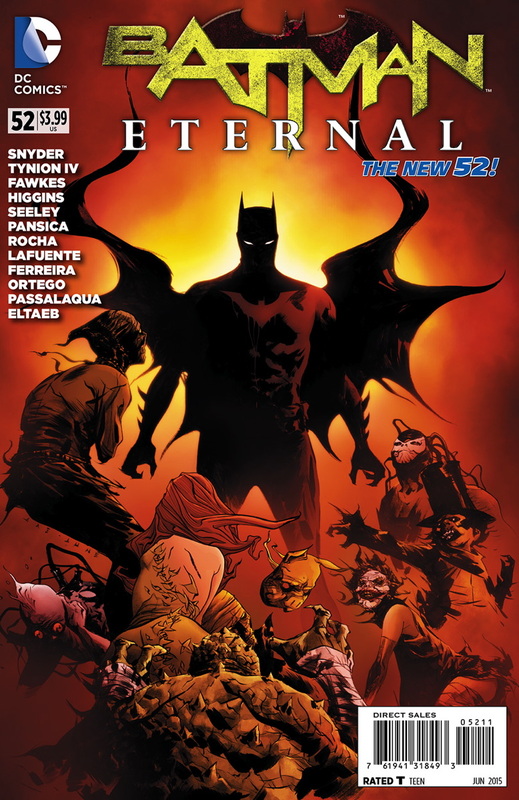 Batman Eternal #52 rounds off this year-long event in fine style, it provides an exciting finale to DC Comics weekly Batman series, and sets the scene for the next era of the Dark Knight legacy to begin in earnest. 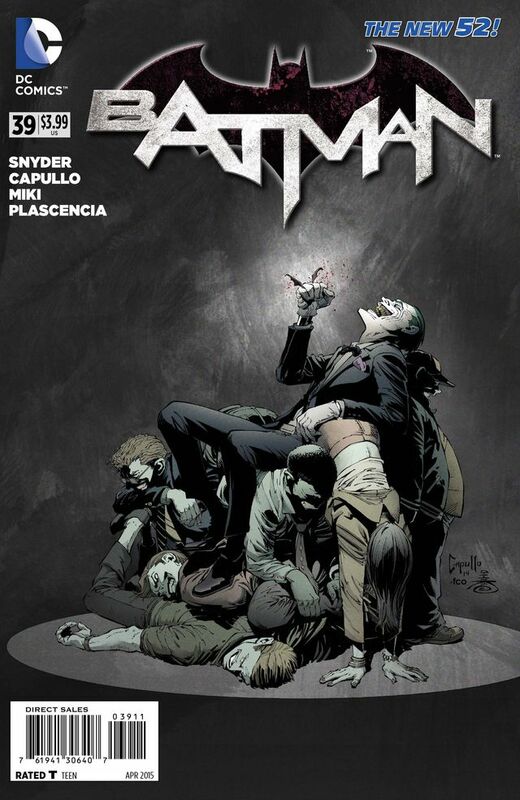 The Clown Prince of Crime’s terrifying return to Gotham continues in Batman #39 as Scott Snyder and Greg Capullo ominously flip the Bat-Signal upside down for one their most apocalyptic and brutal issue so far. Endgame: Part 5 begins with a secret pact, a funeral atmosphere, and the most striking portent of doom the Dark Knight has ever seen. From here we rejoin last issue momentous cliff-hanger, as Batman confronts the Court of Owls in the underworld beneath Gotham, but his attempt to discover where the Joker obtained the chemical Dionesium – which is also in the electrum Court of Owls use to bring the Tallons back – is hindered by their lofty indifference and warped perspective of Gotham from their underground domain. The return of the Court of Owls in this penultimate chapter of Endgame serves to reinforce the epic nature of this storyline. Endgame will surely stand as the pinnacle of everything Scott Snyder and Greg Capullo have established so far during their run, its ingenious how they’ve brought the various elements from their previous story arcs together, the addition of the Court of Owls now brings everything full circle to stand alongside Death of the Family and Zero Year as events build inexorably towards Endgame’s final act. Although the mystery of the Joker’s immortality remains an elusive conundrum, Batman’s confrontation with one of the first Tallons, Uriah Boone, does at least scratch one very intriguing question across the wall of history for us to dwell over. However, it is the Joker’s actions in Batman #39 that soon overshadow and questions about his immortality, when the Clown Prince of Crime savagely attacks someone close to Batman. It’s a scene that is sure to become one of Endgame’s defining moments. One that brutally cleaves through the unthinkable, scraping on bone and sinew, before leaving us cradling our shock in disbelief. From that hauntingly evil cover onwards, Greg Capullo’s art wrings every nuance of darkness and horror from Snyder’s scrip, triples it, and then brings it all to life to on the page with such intensity its literally breathtaking. The scenes with the Court of Owls are stunning, their realm seems even more menacing than before, and the fight with the Tallon is another great moment. Capullo’s Joker is absolutely magnificent! Evil to the extreme, and shockingly violent, the Joker’s entrance alone – as he glances back at us over his shoulder with that bloodied grin and manic twinkle in his eye – is a macabre delight that sends chills down the spine. Gotham itself has never looked so bleak and dangerous; Danny Miki’s excellent inks and FCO Plascencia’s rich colors excel throughout: the Court of Owls lair is an ominous well of undulating light and shadow, while the gaudy mania of Joker’s parade is reminiscent of a similar scene from Tim Burton’s Batman (1989). In this months backup story, The Last Smile, written by James Tynion IV, with pencils by Dustin Nguyen, inks by Derek Fridolfs, colors by Dave Mccaig, and letters by Steve Wands, finds the escaped Arkham inmates given the task of telling their stories about the Joker to Doctor Zaheer embarking on the last stage of their journey. It is here, as they make their way into the dark depths beneath Gotham City, that Dr Mahreen Zaheer finally learns the truth about the Joker. Now she must choose which of the stories she believes is real, confronting a horror that will take her to the brink as truth and lies entwine to have the last laugh. The backups James Tynion IV has written for Endgame have all been exceptionally good, brining adding depth to the main storyline, and Tynion ensures that this final, twisted chapter is the most chilling of all. 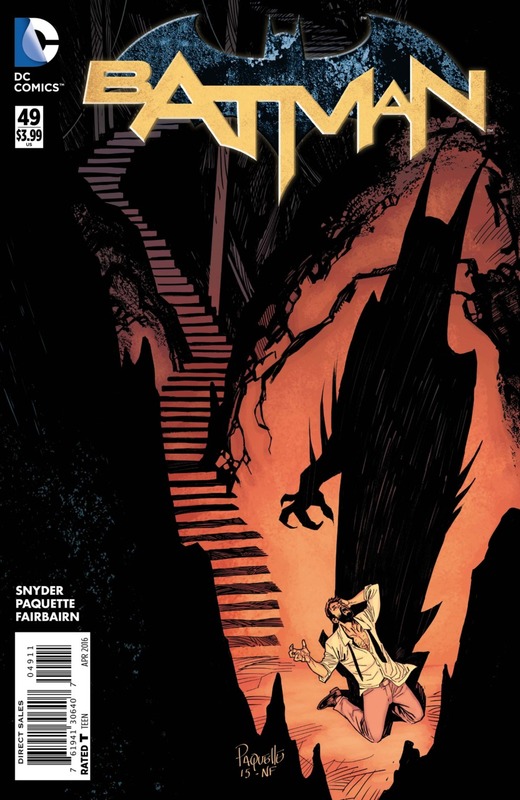 Scott Snyder expertly shuffles events in Batman #39 as though they were a time-shifting deck of cards, effortless splicing the flashbacks set only a few hours in the past with the carnage unfolding in the present. As the pieces gradually begin slot into place we are presented with a unique perspective of these events, sometimes even witnessing things happening in the wrong order, as this ultimate no-win scenario brings the entire Bat-Family and the major players from Batman’s rogues gallery together to save Gotham from the Joker. So, is the Joker really eternal? The evidences would seem irrefutable, yet gut instinct says otherwise. The virus in his blood has also given Joker the ability to heal, making him seemingly unstoppable, but it is the prospect of the Joker’s immortality that remains one of Endgame’s biggest talking points. In fact the more you think about it the more impossible it seems. I for one, have absolutely no idea or complex theory to offer, I’m stumped (An unfortunate choice of words perhaps? ), and I think that’s what I like most of all about this story arc because Snyder and Capullo have kept us guessing every step of the way. Whatever the outcome might be, I’m sure that Scott Snyder will undoubtedly have something fiendishly clever and unexpected lined up for us in Batman #40 that will bring Endgame to a thrilling conclusion.